There are certain authors who have an uncanny ability to make me interested in a topic in which I had previously had little to no interest. Among these authors are Bill Bryson, Sarah Vowell, and Mary Roach. I will read books by these people regardless of subject, and I have found that (with a few exceptions), I will enjoy books by these authors regardless of subjects. Which is why I lined up at BEA (two years ago now!) to meet Mary Roach and get her to sign my ARC of Packing for Mars, despite a previous lack of interest in space travel. Note that I say previous, because after reading Packing for Mars (ok, I didn't actually read my signed ARC, I listened to the audio version from my library), I can now say in all honesty that I am interested in space travel. Really! After all, we're working towards a long-term mission to Mars, people! * We should be into this! and various names for human waste. The audiobook of Packing for Mars reminds me of the narrators I used to hear in sixth grade science classes, accompanied by manual projector slides. ** This kind of expressive yet matter-of-fact narration brings Roach's subtle humor to life in the most perfect way. Even better, the production of the audiobook has allowed Roach's often-hysterical footnotes to shine through as well as they would have done in the text itself. After all, it's hard to take anyone too seriously when they are writing about drinking their own urine (something Mary Roach really did in the name of research***), but the fact is that drinking urine has been considered (and in some instances, is still being considered) as a means of keeping astronauts hydrated for long flights. It is the fact that Roach is able to discuss important but slight stomach-turning subjects like this with a straight face, and the narrator is able to deliver them with a straight face (or at least what sounds like one) that gives readers new understanding of the absurd, and how sometimes, in some instances, the absurd is actually quite reasonable. 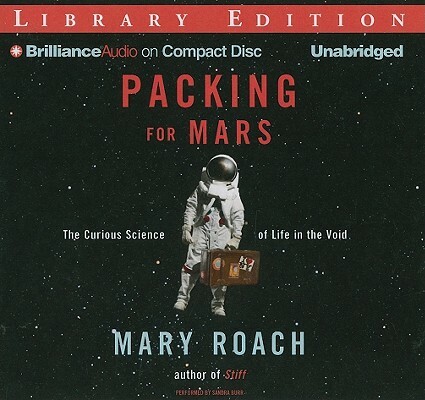 As it has done for her in the past, this ability--coupled with sheer enthusiasm for thorough research--has made Packing for Mars another success for Mary Roach. Whether or not you have any existing interest in space travel, rest assured that Mary Roach will entertain and delight with Packing for Mars... as I'm sure she will with any books she writes in the future. Hopefully the near future. * Or, according to some, a 51st state on the moon. Though if certain politicians were to read about all that goes into space travel, or even just what space travelers have to eat in order to survive, certain politicians might think differently about this plan. **Remember those things? With the emphatic yet monotonous male voice telling the teacher when to click through to the next slide, and the expressive yet matter-of-fact lady dictating additional information about each slide? *** Before you freak out too much and insist that urine is not actually drinkable (and you're right, it's not), note that researchers have developed a way to filter and sanitize urine (and other human liquid waste, such as sweat) into a drinkable liquid. While it might not taste good, it is practical. And given the experiments that Roach participated in while researching Bonk, can anyone say they are really surprised that she was willing to do this in the name of space research? Bill Bryson is one of my always-read authors too -- and I've liked all of his books. I've only read Stiff by Mary Roach, and I'd kind of forgotten about that, but I'll have to look into more of her books. *smacks self on the forehead* THIS is the book I was going to get my brother for Christmas! I KNEW I was forgetting something!! Thank you for the reminder. (And the great review.) His birthday is months away, but if I buy it now, I'll get to read it! I'm going to pretend this was all part of my master plan. Thanks for the tagging! I hadn't seen it before (it's been a crazy week!) but I will play along this week! Funny - I just reviewed this today too! I haven't read Spook or Bonk, but after reading two of Roach's books I can feel her moving into "I will be interested in anything this author is interested about" territory, too. Up till now, it's just been Bryson there. Sometimes Roach's footnotes annoy me a bit (she can go SO off-topic), but I love how she looks at everything with a straight face and makes these bizarre elements of life seem absolutely normal. And, well, what you said. When I linked to your review, I didn't even notice it was just posted today! You're right that her footnotes can go off topic, but I kind of love that... I think the same way, I guess, and tend to go down the rabbit hole of interesting information when I find it. Thanks for reminding me how much I love Mary Roach. I really need to read Bonk. It's sitting on the shelf, so I have no excuse. Stiff is still my favorite of hers, but I do love Bonk! Stiff is my favorite of hers! I adored Stiff when it first came out and I bought a copy for my mom for Mother's Day and quickly stole it and read it myself. I fell off the wagon a bit with Spook, and I need to give Bonk another go. This one sounds like it's Stiffworthy, though. Loooove me some space exploration. I loved Spook simply because it was Mary Roach, but I think it's my least favorite of hers. This one was back up at the level of Stiff for me -- and I didn't even care a wink about space travel before I started reading (or listening).